Background: Succinic acid is an important platform and/or commodity or specialty chemical with a broad range of applications. 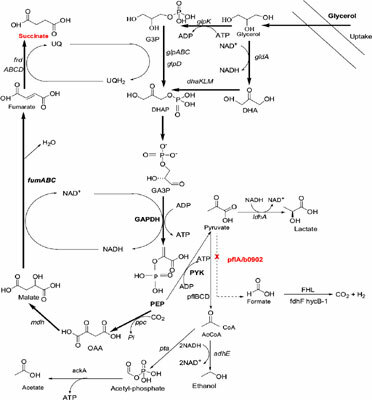 The metabolic role of pyruvate formate lyase A (pflA) in relation to succinate production in Escherichia coli under anaerobic conditions from glycerol substrate remained largely unspecified. Methods: Herein, we identified pflA gene for the first time, as a novel gene knockout target for increasing succinate production in E. coli. Guided by E. coli reconstruction iJO1366, we engineered the E. coli host metabolism by deleting the pflA, thereby causing the up-regulation of glyceraldehyde-3-phosphate dehydrogenase (GAPDH), which hypothetically increases the generation of NADH and the pool of phosphoenolpyruvate (PEP) in the central carbon metabolism, required for succinate production. This strategy produced succinic acid that is 32 fold (1.53 g l-1 in 7 days) from glycerol substrate. Results and Conclusion: This work elucidates that pflA is a novel gene deletion target for increasing succinic acid production from glycerol in E. coli under anaerobic conditions. In addition, these results highlight the power of metabolic model in identifying novel gene deletion target and ultimately driving novel biological discovery. Escherichia coli genome-scale model, metabolic gene knockout prediction, pyruvate formate lyase (pflA), glycerol, enhanced succinate, succinic acid.